See that cell phone next to you? Unfortunately, you're paying too much money for it--every month. If overpaying for what you need sounds like a bad idea to you, stop doing it. We've assembled 12 simple actions that you can take to reduce your cell phone bill, so that some of the cash you now spend for service--maybe even half of it--remains in your possession. So check out our tips, and use one or more of them to save big bucks on your bill. 1. Find the right plan for you: Carefully review how often and in what ways you use your phone. Ideally, you should do this before signing a cell phone contract, but of course it can be difficult to know exactly how you'll use your phone until you spend time with it every day. If you're already using your phone, take a close look at your plan, examining the calling, messaging, and data options you've chosen. Then scrutinize your usage pattern. Check several months of phone bills to see whether you pay for more minutes and megabytes than you use, or whether you regularly exceed your usage limits. How much can I save? Let's use a Verizon Wireless plan as an example. $39.99 $0.45 $135 over your $39.99 monthly fee You don't have any--and you're paying much more than your monthly fee Bump up the minutes on your voice plan if you consistently exceed your minutes limit. $59.99 $0.45 $59.99 $135 versus the 450-minute plan with overage charges Drop to a lower monthly rate if you would almost never exceed its lower minutes limit. On the other hand, if where you exceed the 450-minutes-per-month maximum just once during the life of your two-year service plan--even if you exceed it by a lot that one time, you still come out ahead with the lower limit overall. Suppose that you incur $157.50 in overage fees one month but stay under the 450-minute limit during the other 23 months of the service contract. Then you've saved overall by opting for the $39.99-per-month contract instead of the $59.99-per-month contract, since paying $20 more each month for 24 months would cost you an extra $480. Suddenly, that one-time surcharge of $135 seems like a bargain. 2. Trim the fat: Examine your cell phone to see what services you're paying for above and beyond your voice and data plans. 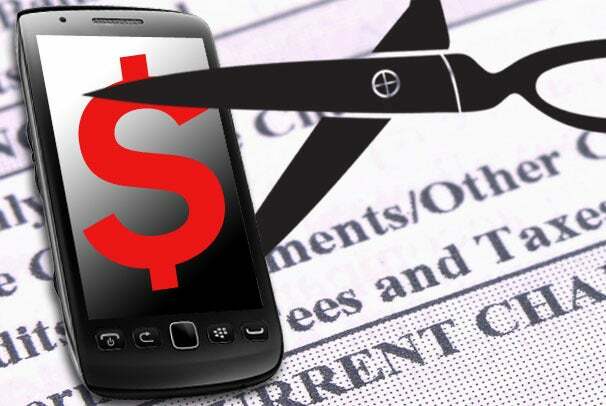 Are you paying your carrier for mobile insurance? A GPS service? Roadside assistance? Visual voicemail? Then think about whether you need these extras. In the case of voicemail, for example, your call log shows you the name and number of incoming callers, anyway--and that's free. How much can I save? This time, let's use AT&T as an example. Opting out of just half of these billing add-ons can save you anywhere from $7.97 to $26.97 each month. 3. Go data-free: Kick it old-school style by dropping your data plan altogether. This option may not be available if you've purchased a smartphone that requires a data plan; but for some consumers it's a sensible move. And it is possible: When my iPhone 4 suffered a fatal fall recently, I went back to my elderly flip phone and relied on an iPod Touch for apps and Internet services. When I wanted to check email or browse the Web, it was Wi-Fi only. My pockets were heavier, in part because I was carrying two devices around, but also because my pockets had more cash in them thanks to my lower monthly bill. How much can I save? $15 to $50 a month, or more. 4. Go on a data diet: Not ready to opt out of a data plan completely? Try cutting back instead. WhatIsMyCap.org suggests ways to avoiding overage charges. Opt for the lowest-tiered data plan that your carrier offers, and make sure that you stay within your limits. Visit WhatIsMyCap.org, a handy site that offers tips on avoiding overage charges, using your current data plan as an example. Also, find out what apps are claiming most of your bandwidth; the culprits may be obvious ones like Pandora and Netflix, or sneaky ones like Google Maps or free versions of games like Angry Birds that increase your data usage by serving up ads. How much can I save? $15 to $35 a month, or more. 5. Compress, compress: Having trouble reducing your data usage? Check out Onavo's free iPhone and Android app, called Onavo Extend, which claims to make your data usage up to five times more efficient. Onavo Extend can help you with data costs. t runs in the background on your phone, compressing your data by routing it through Onavo's servers and stripping out the extras. Yes, that means the company knows what data you're accessing; but that's the price you pay in exposure for the monetary savings you'll see on your cell phone bill. How much can I save? $15 a month or more. 6. Switch carriers: AT&T, Sprint, T-Mobile, and Verizon Wireless are the big four in cell phone service, but they're hardly your only options. 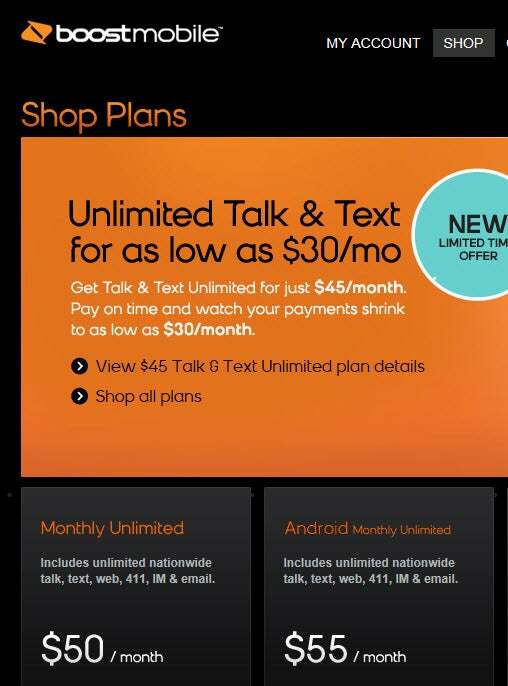 Boost Mobile offers low-cost unlimited Android and BlackBerry plans. Signing up with a smaller carrier, like Boost Mobile or US Cellular, can cut your monthly cost significantly. In contrast, opting for a similar plan from Sprint, which is one of the only big carriers still offering an unlimited data option, will cost you $99.99 a month for unlimited voice, data, and messaging. How much can I save? $40 to $45 per month.